The Vision evades our gaze no longer! After months of snapshots, concept art and a glimpse of his face in a trailer, Marvel has finally given us an official full look at the superhero android in Avengers: Age of Ultron. Check it out! 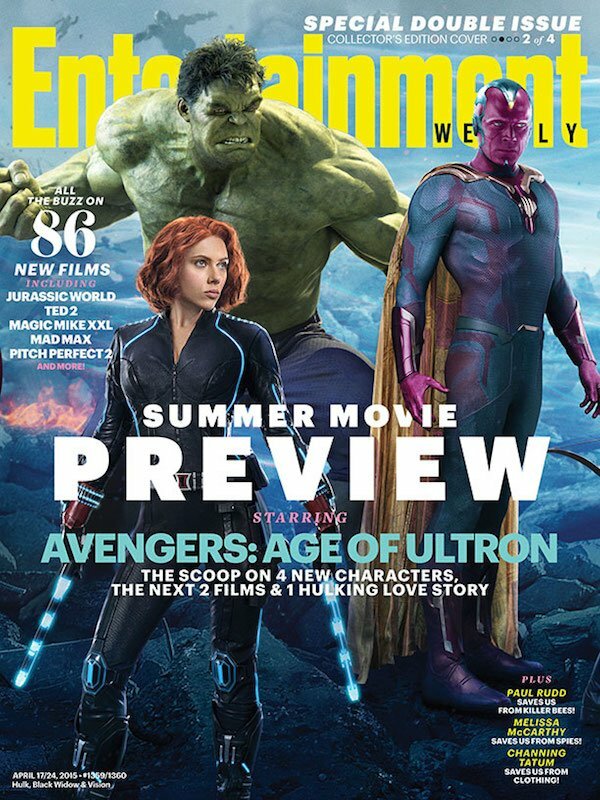 This full body shot comes courtesy of Entertainment Weekly, which will have four different Avengers: Age of Ultron-themed covers for its Summer Movie Preview. You can head over to their site to see the other covers and a banner of all the Avengers facing off against a menacing Ultron - but what grabbed our attention is Vision’s cover, where he is accompanied by Black Widow and Hulk. While we’ve already seen detailed artwork of the MCU’s Vision, nothing beats seeing the real deal, and the costume and makeup department did an excellent job of transforming Paul Bettany into the android. His color scheme from the comics is largely intact, from the red-purple skin to the green costume (with red patterning) to the yellow cape. The only major differences are his gloves being dropped and the boots being darker, but hey, small changes are called for when adapting a costume for the big screen. The image also does a good job of conveying an artificial and organic feel for his appearance, showing that he isn’t just your average mechanical man. The article also gives more hints on Vision’s creation in the film. When Ultron, who is developed from a combination of Tony Stark and Baron Strucker’s robotics work, becomes sentient, he "shreds" Tony’s AI J.A.R.V.I.S. and creates the "synthezoid" Vision. It sounds like the movie will follow Vision’s comic book origin and have him fighting the Avengers first before he joins the good guys and helps them take down his creator. Many have speculated that Vision is some type of enhanced J.A.R.V.I.S., since both are portrayed by Bettany, but that has yet to be determined. If J.A.R.V.I.S.’s shredding is permanent, then Vision is simply a separate creation of Ultron’s. On the other hand, perhaps a remnant of J.A.R.V.I.S.’s program will remain intact and somehow transfer into Vision, giving him the moral compass that Ultron’s other robotic minions don’t have. We will see Vision alongside the rest of Earth’s Mightiest Heroes when Avengers: Age of Ultron is released in theaters on May 1st.